Takahashi FSQ-106ED @ f/5.0 (530 mm F.L.) Captured at 2.1 arcsec/pixel. Shown at 3.69 and 9.39 arcsec/pixel. SBIG STF-8300M Self Guiding Package w/ mono ST-i, using AstroDon E-Series LRGB filters. 9/12/2017 to 9/16/2017 Chino Valley, AZ with CCD Commander & CCDSoft. 600 min. (20 x 10 min. each) "
eXcalibrator v5.0 for (g:r) color balancing, using 223 stars from the SDSS-DR9 database. PixInsight processing includes calibration, registering, stacking, RGB creation, gradient removal, non-linear stretching with HistogramTransformation. PhotoShop final touch-up includes background noise reduction. This beautiful structure is in the Taurus molecular cloud. It is about 450 light-years away towards the constellation Taurus, in the Orion Arm of our Milky Way galaxy. 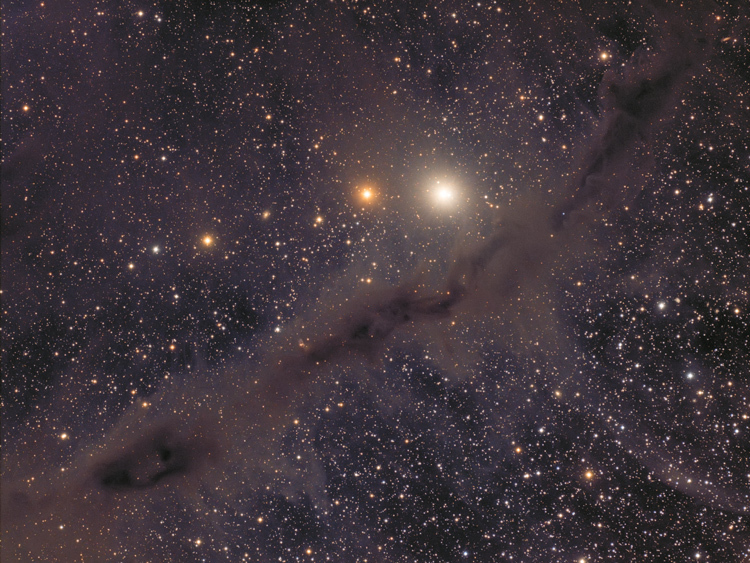 Various dark nebulae accent the diagonal dust lane. The image has two prominent dark regions that Edward Barnard identified and photographed in 1905. At the upper-right is B211 and at the lower-left is B216. As one of the closest molecular clouds, this region is an ideal place to study the formation of stars.